You wanna assemble a "Starter Deck" of Shmups for your XBOX One, PlayStation 4 or your PC? Then, AIPD: Artificial Intelligence Police Department is part of that Starter Deck. The game features 5 gameplay modes with unique conditions and bonuses. STANDARD: Your basic Main Game, where hostile conditions and enemy number increase as your clear a level. TOUGH TRANSPORTERS: Similar to "Standard", but the Transporters are fully upgraded at the beginning of the game for an aditional extra-challenge. HOSTILE SPACE: Stage hazards are activated from the beginning. 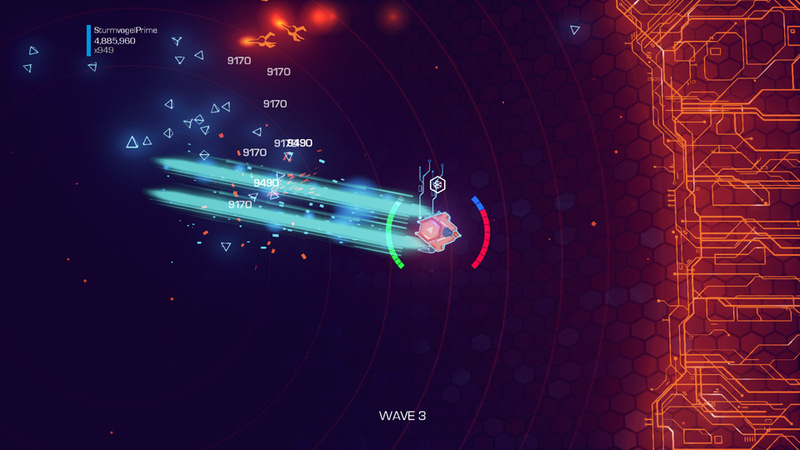 HIGH-TECH ARMADA: All the enemies in the game are fully upgraded for the ultimate challenge. DESIGN: The "Edit Mode" of the game where the player creates its own conditions and enemy formations. The game gives you an arsenal of weapons to fulfill your mission at the AIPD. However you can only access to one of them at the beginning, the rest are unlocked as you accumulate points in your career in the AIPD. GATLING: The initial weapon. This is your basic Vulcan/Machine Gun. This is a short ranged rapid fire focused on straight shooting, although some of the bullets go into an angle like a rapid spreadshot, addressing the flaws of a full straight shot for a moment. SHOTGUN: This is the Spreadshot type weapon. Like the Gatling, it is a short ranged weapon. Getting close to a target will increase its overall damage potential. Also, tapping the fire button will increase its fire rate making it a more effective weapon. PHASER: I could describe it as the Homing-like weapon of the game, but instead it works like the Free Range from Thunder Force V. A tactical "Murder Beam" which only activates when an enemy enters to the "Range cone" and goes off once its destroyed or leaves the cone. ACCELERATOR: This is the rapid "Armor Piercing" type of weapon. It fires a hyper velocity bullet capable of pass through the enemy. HOWITZER: The "Grenade" weapon, This weapon fires projectiles that stop after reaching a certain distance and then they detonate with a short ranged explosion, just like the Grenade from Super E.D.F. : Earth Defense Force. LASER: It's name will obviously imply a powerful beam capable of inflict terrible damages, but this weapon is actually a short-to-middle range energy beam that cuts through your enemies ( ¿Remember the Aryustailm "Sword" charge from Blazing Star? ), however, the Laser's strength increases as the weapon gets closer to Overheating. OVERHEAT MINE: This is a sub-weapon available regardless of which weapon you have selected. Once the weapon Overheats, your ship will drop a mine. However, there's three fatal flaws: First, the mine drop pushes your ship, second the explosion DOES NOT INFLICT DAMAGES TO YOUR ENEMIES and the third one is the worst: It damages you if the explosion reaches you. That's a flaw which can be fatal in tight spots. 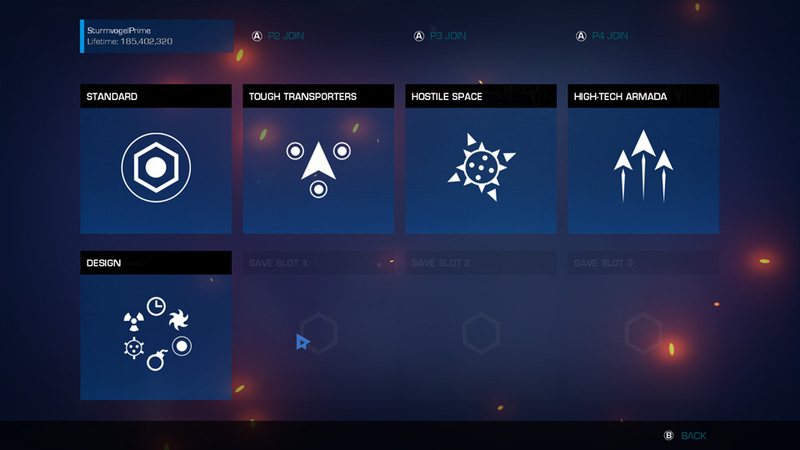 The second Weapon Select screen of the game. 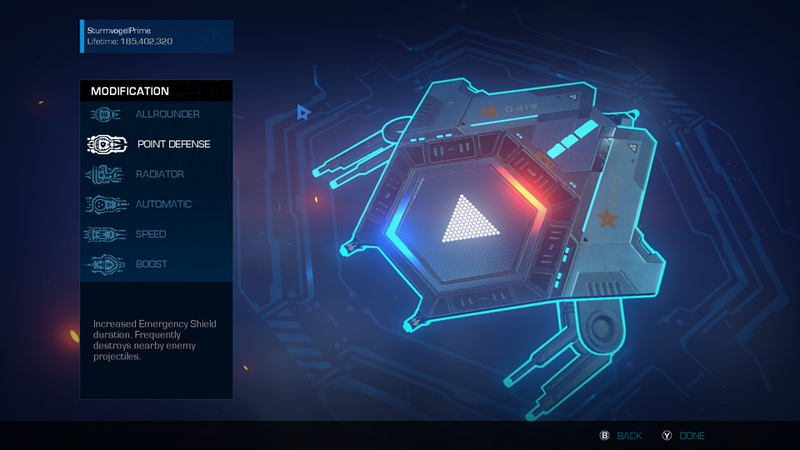 This one allows you to pick an upgrade for the ship which will affect its performance in one way or another. Like the weapons, you can only use one of them at the beginning and the rest have to be unlocked by your overall score. ALLROUNDER: Your initial configuration. Giving balanced Shield levels, Overheat temperature and speed. POINT DEFENSE: This is the most useful of all, because it increases your Shield gauge adding more hit points. It also destroys nearby projectiles. RADIATOR: Increases your ship's cooling time, delaying the Overheating. But it has a flaw: Decreases your total Shield Hit Points. AUTOMATIC: This Modification picks the items automatically for you rather than go and pick it for yourself. SPEED: Increases the ship's speed but this Modification also sacrifies the Shield Points. So it's a crap-shoot for a strategist. BOOST: It uses the Overheat duration and increases it, but also increases the flight speed based on how hot the engine is. There's also additional items called "Pickups" and Special Weapons to provide you additional help and firepower. Pickups are the "Defensive" type of items which provide you helpful upgrades like short time boost in score multipliers, temporary "No-Overheating", momentary Shielding (Temporary invincibility) and Time Dilation, which slows down time kinda like the Stopwatch from Castlevania, this one is the most effective on surviving the most time possible in the game. Special Weapons are the items that increase your Offensive capabilities, giving you Super Torpedoes, Super Bombs, Super Missiles and the Boss-stage exclusive Super Shield. The Super Torpedo requires to hold the button to detonate it at the desired distance pretty much like the bomb in Raiden Fighters, Super Missiles have the same "Free Range-like" system of the Phaser, but its only for Lock-On their targets, and Super Bomb is your typical bomb that clears everything on screen. "Trouble to the left. Danger to the right. I feel it all around." Said the song "Take me away" from Gumby The Movie. ¿What does this have to do with your mission in the Artificial Intelligence Police Department?. Well, as you can see in this pic, there's only to choices everytime you clear a stage: Bad or Worse. The Challenges are the "Selectable Punishment" and there's no way to evade them. Reading what would happen on either challenge is crucial for survival an even your overall score as there's situations like "Leak" which bleeds out your multipliers and do-or-die hazards like the Omega Bomb, where an enemy will drop a bomb which will damage you wherever you are if you don't pick it for disarm it. There's other less harmful like Electric Fence which damages your ship everytime you touch the wall of the arena, Short Fuse which reduces the time of your mines, and the usual enhancements for your enemies like Shielders for Escorts for Transporters. An overall of 24 digital diseases are waiting to put an end to your ship's existence along with your career in the AIPD. However, the challenges also give aditional Multiplier bonus. +50, +75 and +125 Multiplier Bonuses are waiting for you as a reward in an attempt of make the gamble worthy. To guide you, i'll bring you a level of five to determine which ones are the most or less dangerous. Like Polychromatic and Geometry Wars 3 Dimensions, this game is your "Arena-Shooter" where you're pitted to a circular battlefield surrounded by multiple enemies. The main objective of this game is to survive as long as possible and reaching a high score while doing so. Clearing a level will lead you to a "Select a Challenge" where you have to decide which is the less harmful condition for you, sometimes you have to make a critical choice (Example: selecting Omega Bomb or Beam Sweep for Wave 5), this is more of a point of decision where you will have to decide to face great damages for the sake of major score Multipliers or go to the easy thing but with less bonus. 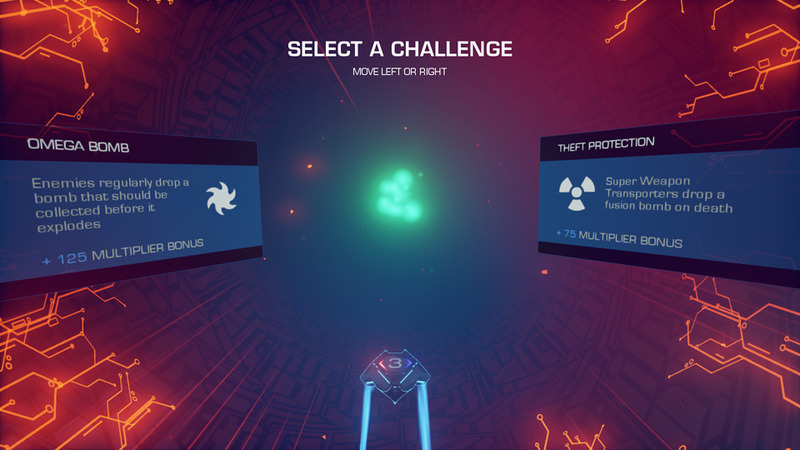 Unfortunately, the game is way to stingy with its concept of survival, unlike Geometry Wars 3 where do you have lives to complete a level, in AIPD you have one single life to survive all the 15 Waves of enemies. This can be a nightmare for those who want to complete the game in the Blazing difficulty, since the difficulty also reduces the amount of Hit points for the player. We already know the game have 15 Waves. 14 Waves are the typical "You against everyone" in the arena, but in Wave 15 it's "Boss Time", where you fight the boss and to survive you have to use the item it drops: Super Shield. So my best strategy against the boss is to pick the Time Dilation and the Super Missiles and use them against him, then pick the Super Shield to reflect the bullets. Graphically, the game's based upon Cyberspace and digital circuitry. Very few times we see a game focused in this environment. Thunder Force V's "From the Bottom of One's Heart" is a good example of how a game can play with the digital universe within the computer network. 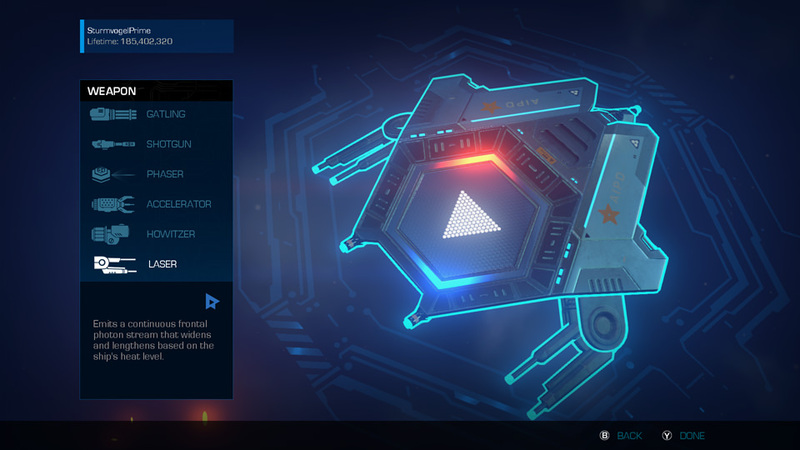 Another graphical feature is the "Vectorial graphics" based on 80's games like Asteroids and Tail Gunner, bringing the fascinating world of the 80's vectors to the present day in a whole new scale and massive detailing. As the game is based on the electronic battlefield, there's no "fireballs" as explosions, instead we've got enemies deleted and Super Bomb blasts with flashing circuitry spheres giving a massive light spectacle in the battle. The music of this game feels like the music score of a Sci-Fi thriller in the vein of films such as Blade Runner and Tron Legacy, as the solemn trumpets and suspense notes are followed by trance-techno beats to fit the electronic battlefield where the game takes place. This game will be a visual eye-candy for 80's fans and a satisfaction altogether for Arena-based shooters.